"ZUNI FETISH WARRIOR" "Trilogy of Terror"
Who says that new dolls can't be haunted cursed or possessed by some evil spirit. It has comer to my attention of such a haunted doll. And it happens to be a doll replica of none other then the legendary "ZUNI FETISH WARRIOR" "Trilogy of Terror" PROP DOLL. Many of you may be astonished to learn that new dolls still in the box straight from the manufacturer can be hastened or empowered by supernatural forces. I have recently met someone that as far as I can discern is totally afraid of their husbands Zuni Warrior doll. This because she believes it is haunted, cursed or possessed by the evil spirit of a ghost or a real live demon from hell. She came to this conclusion after her husband bought the haunted doll and saw the scary horror movie for the first time. Pediophobia the real personal fear of dolls has been more then heavily exploited in movies and many blog's and forums Today. In most of these occurrences, the premise is that a seemingly harmless doll has become a intelligent sentient evil possessed being out to destroy all in it's path. Whether this is through use of condemnation a soul to inhabit the doll through black magical spells or random chance that a evil ghost or demon has attached itself to the doll or toy. The general real "Fear Of Dolls" is usually caused by an intense negative experience from your past. At first I believed she was playing a joke on me until I had a few very intense long conversations with her directly. And then I got to meet this, the most very real scariest haunted doll ever eye to eye. I believed that this poor woman was just setting herself on edge dealing with her own fears and an over active imagination. this in many cases is what those that investigate the paranormal actions of haunted dolls usually assume. My email conversations went on for many long months. She would tell me how she felt it looking at her through the glass display case her husband kept it in with all his other expensive horror movie collectable's. the fear grew so strong she refused to go into the room and would not let her child enter it either. Then one day stranger things begin to haunt her and her family. And she knew it was this evil haunted doll at the root of it. "The other collectable's begin to break as if they where under attack by some strange force. At first they thought their 9 year old had been opening the huge doors to the large china cabinet her husband had taken over as his display, and breaking his dads treasured collectable's. A few days went by and more were broken. Their poor son was punished each after day after the discoveries. Until one weekend when he was away with his mom visiting her family in a different state. The husband that night found another item broken. He removed that one and an hour later he found another. And it was always the ones placed next to the Zuni Warrior doll that were destroyed. We must note here that the Zuni Warrior doll is still in it's original packaging and has not been removed. He moved the doll's box to a higher shelf and placed two new items next to it. They were a ebay purchased Pazuzu replica head from the movie the Exorcist and a Hellraiser true to scale handmade wooden puzzlebox. When he came back an hour later the head and the box has both been shoved to the far sides of the shelf. Astonished he set up his video camera to catch what was really going on. But his camera would not record. So he sat and watched the doll and the objects for over two hours and nothing happened. He left the room and upon returning the two objects were moved again. Aghast by what he saw he then begin to become frightened for he knew something supernatural was going on. His wife upon returning home was alarmed by her husbands story so much that they packed up the doll in an old suitcase and locked it away in a storage unit 10 miles away. And yes just like in the classic Dan Curtis Movies they feared the worse was about to happen to them. The strange doll was then passed on to a local paranormal group. 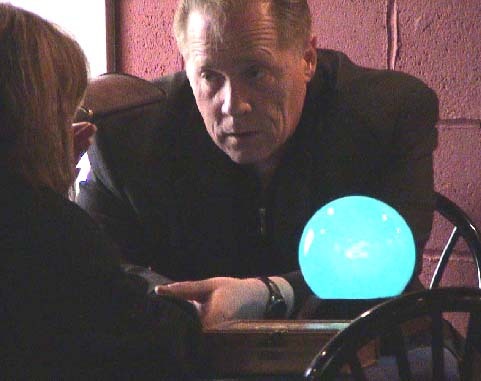 I had suggested for them to call in a real paranormal investigator from the very start but they were turned down by two or three groups in louisville Kentucky area because they thought the young couple were perpetrating a hoax on them. I told them I believed that some evil force had entered their lives that they possibly through their own fears had brought to life. And it was not the actual doll but that they had transferred the fear of the haunting that was effecting them on to the doll. To this they would not hear my explanation and believed it was the evil haunted doll alone that was at the root of the horror they were experiencing. They feared the doll so much they sent a friend who retrieved it from the storage unit and sent it to me. The Zuni Warrior doll has caused no disturbances since it is in my possession. The young couple tell me the haunting has stopped since it is gone from their home. I want it to go on record that I believe this very haunted frightened couple created the actual evil or fed energy to some demonic force that toyed with them. But as far as the doll being haunted it has shown no signs to me of any type of supernatural powers or paranormal occurrences have occurred since brought into my happy home. This haunting in my opinion might just be a case of fear taking over and causing the individuals to create something evil. Or to be feeding an evil entity the energy it needs to manifest itself to cause the damage that the haunted couple experienced. Zuni Fetish Warrior from Trilogy of Terror 13" figure. Includes Spear, Charmed Waist Chain and Display Stand! This item is a poseable prop replica and not recommended for children to play with, It is recommended for adult collectors. Please also see: "REAL HAUNTED DOLLS" : All The Information On Real Ghost Or Actual Demonic Possession Of Baby Dolls That You Really Need To Know! THIS REAL HAUNTED DOLL SHOULD NOT UNDER ANY CIRCUMSTANCES BE GIVEN AS A GIFT UNLESS THE RECIPENT IS FORE WARNED AND 100% AWARE OF IT'S POSSIBLE PARANORMAL ACTIVITY AND CAPABLITIES! The fear one feels when the they think they know the supposed real haunted history of a haunted doll might just be deep seeded from what they saw happen in a recent movie they viewed. Many people around the world no matter how old they are might just be tapping into the fears that they think they have overcome. On the other hand those that hunt for ghosts or explore the paranormal tend to believe that these things are just a figment of their over active imaginations come to life. But if these haunting's are avoided or shoved under the rug by to too many paranormal groups because they feel the claims are untrue. In investigating the many individuals who claim to you about their dealings with the nightmare that is associated to them with a haunted doll, then they are afraid to come out in the open and usually suffer at the hands of the evil that they believe is haunting them. Today it so seems to many groups go into haunted doll investigations with a preset attitude that they are dealing with gullible individuals that are scaring themselves over nothing but an inanimate object. 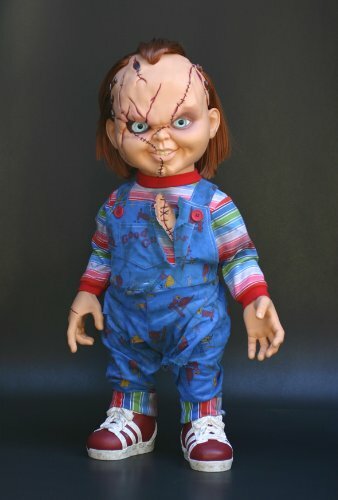 Some items as haunted dolls with pleasant smiles and fair faces might just hold an evil demonic presence or a ghost that has taken up residence and causing such paranormal phenomena to occur. 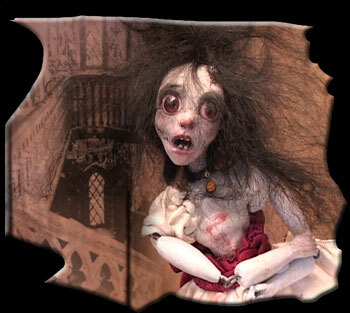 The actual real ghost or demon does not have to live inside the doll. These intense paranormal forces use it as a focal point to haunt the individual. In most cases just by removing the ghost haunted item from the residence the haunting stops cold. and the truth that it is not the doll is often exposed. In my research I have found that many of the claimed haunted dolls do not react or show any signs of being haunted once they come into my possession. Not all cases seem so simple though. A recent case study of a real haunted doll in Sacramento, California proved to be stranger then fiction. The doll was removed from the home and that's when the actual ghost raised all hell upon the poor family. This pesky poltergeist destroyed many personal items of the family until the haunted doll was returned by the paranormal team that investigated it. Some haunted dolls Just seem to be happy sitting and watching the living. There have been stories told told to me by many about how their haunted dolls saving their lives or helping to advert some evil tragedy just by having these spirit guardian haunted dolls in their possession or home. But of course what about the evil haunted dolls that wreck havoc in ones life and the every growing fear of what they can do next? Pediophobia is a fear of dolls or, more generally, of "false representation of sentient beings" such as mannequins or robots. The word is derived from the Greek word paidion, meaning "little child". Ashton Kutcher has publicly stated that he is afraid of his wife Demi Moore's collection of dolls, having grown-up watching Child's Play as a kid. The Austrian psychoanalyst Sigmund Freud claimed that children fantasize about dolls coming to life. Psychologist Ernst Jentsch theorized that uncomfortable or uncanny feelings arise when there is an intellectual uncertainty about whether an object is alive or not, and also when an object that one knows to be inanimate resembles a living being enough to generate confusion about its nature. Japanese roboticist Masahiro Mori expanded on Freud and Jentsch's theories to develop the "uncanny valley" hypothesis, which predicts that as a robot's appearance becomes increasingly human-like, a human will have an increasingly positive response to that robot, until a point is reached where the response changes quickly to one of repulsion. If an object is obviously enough non-human, its human characteristics will stand out, and be endearing. However, if that object reaches a certain threshold of human-like appearance, its non-human characteristics will stand out, and be disturbing. Although Mori was concerned particularly with robots, his theory has been seen as applicable to all inanimate objects that sufficiently seem as though they might be animate. Today the haunted doll rage has never been more alive. Many people seek them out just to own as curiosity. Others want them to maybe just test the fact that they are possibly haunted or not. But as we move though this time of paranormal study and awareness the whole truths still need to come to light.